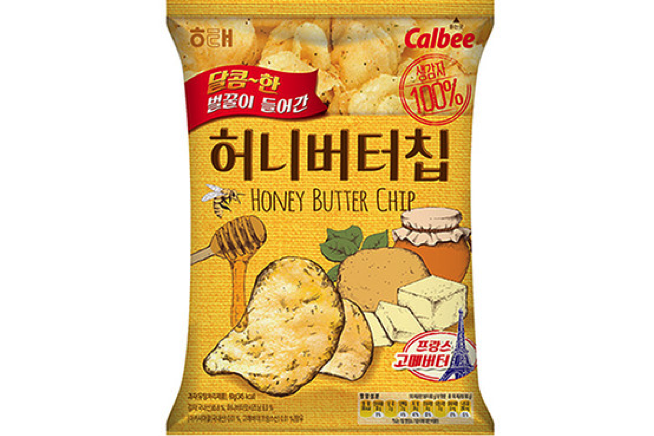 These South Korean supermarket home brand Chips featured a pile of Chips at the top, a graphic Honey Comb and some dripping Butter. The rest was South Korean writing a brand logo and a backdrop of orangey yellow. There was also a curl of Butter with a sprig of Basil at the bottom. For some reason, on the reverse it said they were Baked Onion flavour, which they obviously were not – must have been lost in translation somewhere. These were a very good example of the best of Kettle Chips. They were thick and curly with regular bends and massive oil boils. There was also a smattering of potato skin on edges.